Did you catch Joe Pulizzi’s talk at Content Marketing World 2018? In it, he revealed the secrets of life and marketing (sorry if you missed it). I won’t give everything away here, but I will let you in on one of the (no longer secret) secrets: Cut everything from your day that doesn’t get you to your goal. It’s great advice. And, as Joe notes, it serves people like Bill Gates and Warren Buffett well. Of course, mere mortals can’t necessarily cut out everythingthat doesn’t get them to their big goals. Many of us need to do less than great but still necessary things, like folding a mountain of laundry or reorganizing an overstuffed junk drawer. And sometimes distractions actually help us through those earthbound tasks. If you’re lucky, your chosen distraction may refresh your perspective on the great things you’re working on to achieve your goals. That happened to me recently when I fired up Netflix looking for some inspiration to help me through my household chores. I found a set of surprisingly good marketing reminders embedded in Stay Here, a rental-home renovation show. Marketing advice in a Netflix show? The binge-able Stay Here isn’t overtly about content marketing, although it does offer a few basic tips (think: blogging helps, headlines matter). But there are things to learn. Both hosts, designer Genevieve Gorder and real estate expert Peter Lorimer, demonstrate and encourage something most content marketers value – empathy. That’s what we’re all trying to do with our content, right? Here’s what watching the hosts create experiences for their guests reminded me about the strategy behind creating content experiences for our guests (think: audiences). Each episode includes a discussion of the business and marketing plan for the property. The first step? A review of the owner’s purpose and goals. Who else should start with a review of goals? Content marketers looking for better results. It’s hardly a coincidence that the best of the episodes I watched featured an owner with the most meaningful purpose and goals. Gordy operates the Yellow Block Bed and Breakfast in Brooklyn, New York, and wants to make more money from his property. Although I didn’t watch every episode, I feel confident every owner on the show shares that perfectly fine business goal. And here’s what happens when businesses (tiny ones like his or giants like Nike) stand for something – people rally around them. The emotional connection with viewers earned Gordy flattering media coverage, including this article proudly shared on the Yellow Block’s Facebook page. For example, in one episode, Seattle houseboat owners decide to aim for couples looking for a romantic getaway. Zeroing in on that group let them worry less about designing features that might not work for families with young children. Instead, the houseboat is designed and marketed (think: photos, headlines) to couples who would enjoy features such as a small space, a steep ladder, and proximity to water. 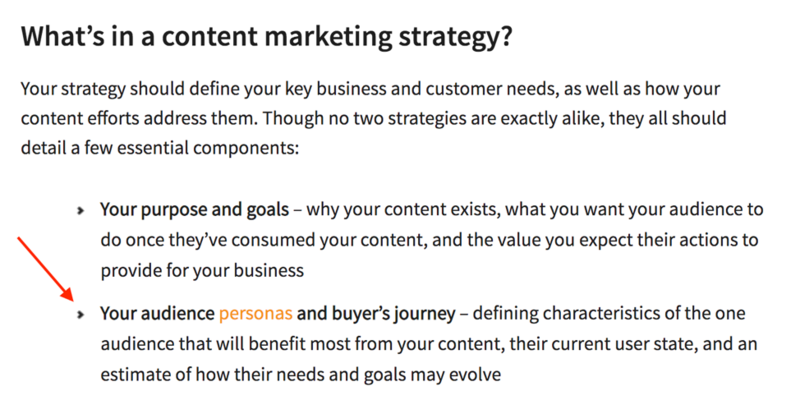 Deciding who you want to reach (and determining what they need, like, and want) is an essential part of a content marketing strategy. This should sound familiar. Why did this stand out to me? It may have been the echo of another line from Joe’s Content Marketing World talk: Strategy is all about choosing. It’s easy to forget that in choosing to focus on one persona (or even a few), you’re also choosing not to focus on people who fall outside that set. And that’s an opportunity in itself. And, sure, that decision opened the marketing team to unsolicited advice and created an opening for a subscription service targeting women. But the tight focus helped the company create enough value that Unilever bought it for $1 billion barely five years after its founding. You don’t have to (and usually shouldn’t) create content and experiences to please everyone. You just have to please the audience you’ve chosen. 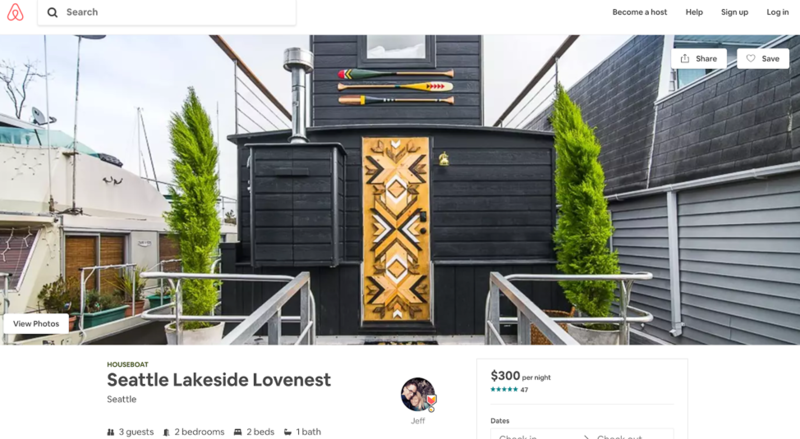 Once the owners featured on Stay Here understand who they’re going after (and who they’re not), they compare their properties only to short-term rentals who go after a similar segment. And then they figure out what they can offer that’s different from what everyone else is offering to that segment. In other words, they work to differentiate their property. Since this is a renovation show, the answer is often great design. Even here, the show includes plenty of marketing considerations, particularly visual ones. In an episode featuring a run-down Malibu property, the redesign focused on the property’s enormous beachfront deck. Other properties might have ocean views, but few, if any, feature a deck that size. The design and business teams decided together to create a pergola with a set of hanging chairs in one corner. They wanted to entice renters with a gorgeous photo featuring a great place to enjoy the view of the ocean – and a place for renters to take (and share) photos of themselves enjoying the ocean. Or by sharing pictures of your property on social media. A great host can make a great experience. And great hosts share something in common: They think about what their guests need. That might be colorful and clear signs telling people they’ve found the right place when they arrive late at night. Or it might be a well-designed content hub that helps people find what they’re looking for (and maybe more). Either way, the principle is the same. Delight your guests, and you’ll keep them coming back for more. Did you miss Joe Pulizzi’s talk or one of other 100-plus presentations? You can catch them all through Content Marketing World’s video on demand. Get it today.